Abuja is the caipital ceety o Nigerie. It is locatit in the centre o Nigerie, athin the Federal Caipital Territory (FCT). Abuja is a planned ceety, an wis biggit mainly in the 1980s. It offeecially became Nigerie's caipital on 12 December 1991, replacin Lagos. 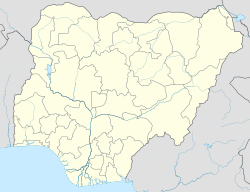 At the 2006 census, the ceety o Abuja haed a population o 776,298. In licht o the ethnic an releegious diveesions o Nigerie, plans haed been devised syne Nigerie's unthirldom tae hae its caipital in a location deemed neutral tae aw pairties. The location wis eventually designated in the centre o the kintra in the early 1970s as it signified neutrality an naitional unity. Anither impetus for Abuja came acause o Lagos' population buim that made that ceety owercroudit an conditions squalid. The logic uised wis seemilar tae hou Brazil planned its caipital, Brasília. Construction broke grund an wis dedicatit in the late 1970s but, due tae economic an poleetical instability, the initial stages o the ceety wur no complete till the late 1980s. The maister plan for Abuja an the Federal Caipital Territory (FCT) wis developed bi Internaitional Planning Associates (IPA), a consortium o three American firms: Planning Research Corporation; Wallace, McHarg, Roberts an Todd; an Archisystems, a diveesion o the Hughes Organization. The maister plan for Abuja defined the general structur an major design elements o the ceety that are visible in the ceety's current form. Mair detailed design o the central aurie o the caipital, parteecularly its monumental core, wis accomplished bi Kenzo Tange, a renouned Japanese airchitect, wi his team o ceety planners at Kenzo Tange an Urtec company. Maist kintra relocatit thair embassies tae Abuja, an mony maintain thair umwhile embassies as consulates in Lagos, still the commercial caipital o Nigeria. Abuja is the heidquarters o the Economic Community o Wast African States (ECOWAS) an the regional heidquarters o OPEC. Abuja an the FCT hae experienced huge population growthe; it haes been reportit that some auries aroond Abuja hae been growin at 20% tae 30% per year. Squatter settlements an towns hae spread rapidly in an ootside the ceety leemits. Tens o thoosans o fowk hae been evictit syne umwhile FCT meenister Nasir Ahmad el-Rufai stairtit a demolition campaign in 2003. ↑ 3.0 3.1 "Life of poverty in Abuja's wealth". news.bbc.co.uk. BBC News, Tuesday, 13 February 2007. 2007-02-13. Retrieved 2007-08-10. ↑ "World Bank Conference: African Regional Roundtable on Upgrading Low-income Settlements" (PDF). www.citiesalliance.org. World Bank, 3–5 October 2000, Johannesburg, South Africa, p. 16. Archived frae the oreeginal (PDF) on 2007-09-28. Retrieved 2007-08-10. Wikimedia Commons haes media relatit tae Abuja. This Nigerie location airticle is a stub. Ye can help Wikipaedia bi expandin it. This page wis last eeditit on 10 Mairch 2018, at 19:46.